If you follow me on Instagram, you know that we went on a quick camping trip over the weekend. 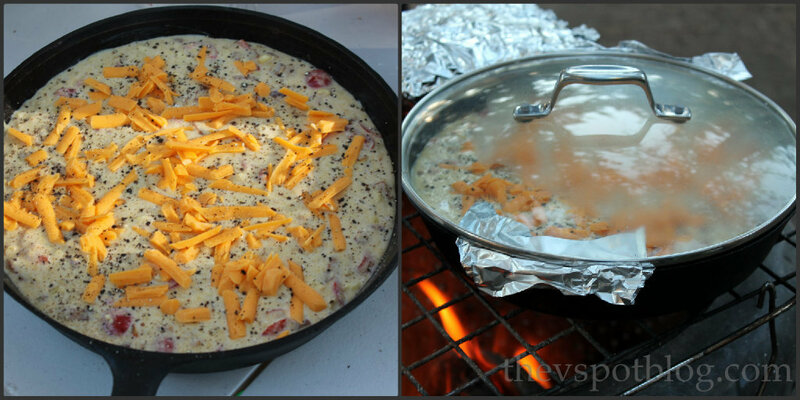 I wanted great food that was easy to prepare and could be cooked over the campfire. I also wanted to use up a bit of what was already in the fridge before we left. 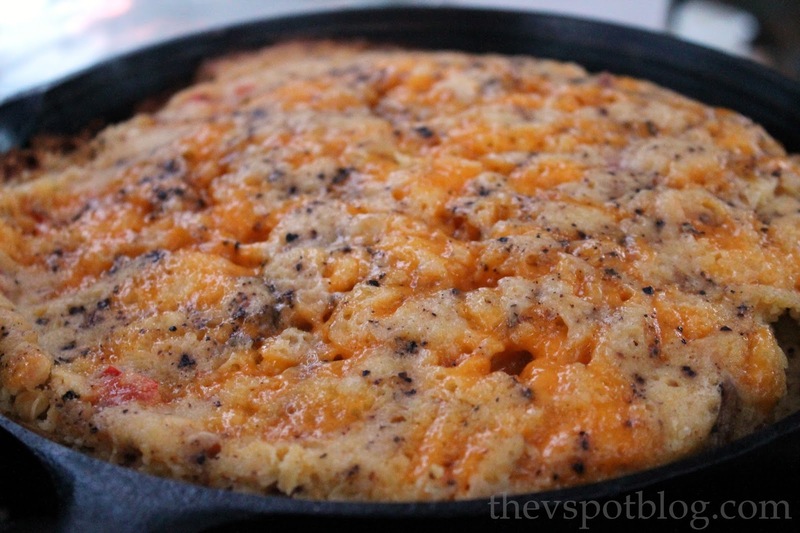 One of the things I made was this Loaded Skillet Cornbread. Shuck and then wash the corn. Cut the kernels off of the cob, then pour them onto a griddle (or into a skillet) with about 2 Tbsp of butter and a generous sprinkling of salt. Cook over medium high heat, stirring occasionally until the kernels are golden and begin to brown a little. I was able to do this at home, as well as fry up the bacon. I put them in separate ziploc baggies and packed them in the cooler. 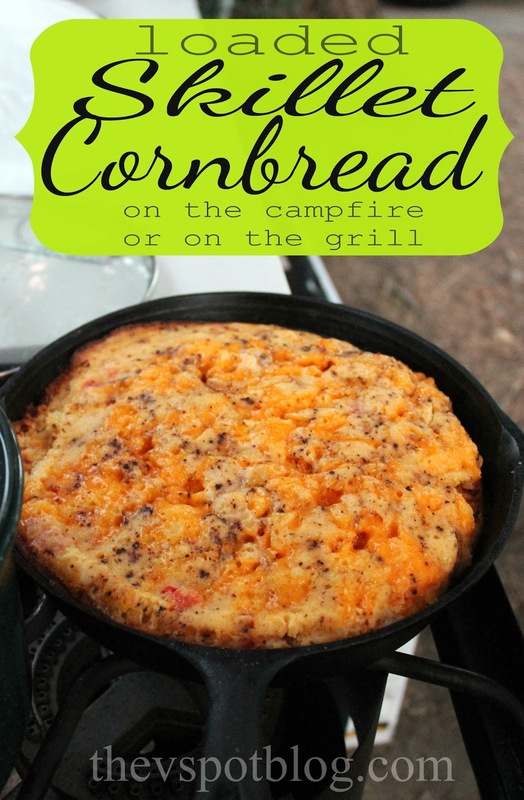 At the campsite, when it was time to start cooking dinner I prepared the cornbread batter according to the directions on the box, then mixed in the tomatoes, corn, bacon, chilies and the salt and pepper. You want to set the skillet over medium low heat. If it is too hot, the bottom will burn. You can do this over the campfire, or on the grill in your own backyard. You will be able to tell when it’s done with the top becomes a beautiful golden brown color, and a knife inserted into the middle comes out clean. Ok this sounds kind of like the tamale pie my mom used to make, only way better! Yum!! If one of your first ingredients is bacon, you have my heart. Yummy!! m usually not a big corn person but this recipe looks like it will convert me…delish! Just tried this recipe, and it was amazing 🙂 I live above 7,500 ft so I added 1/4 cup of flour for high altitude cooking, and it came out great. I cooked it for about 20 minutes in my oven at 400 degrees, and covered it loosely with foil.